The remnants are bringing heavy rain to the Southwest. Rosa is a tropical depression as it moves over Baja California and spreads heavy rain into the Southwest and the Rockies on Tuesday morning. 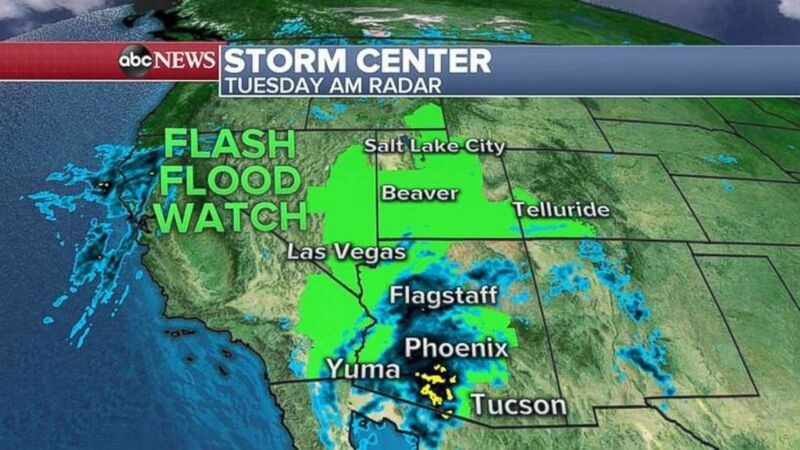 Flash flood watches have been issued for seven states from Arizona to Idaho. Life-threatening flash flooding is expected in the region Tuesday. (ABC News) Flash flood watches are in place across seven states on Tuesday due to the remnants of Rosa. 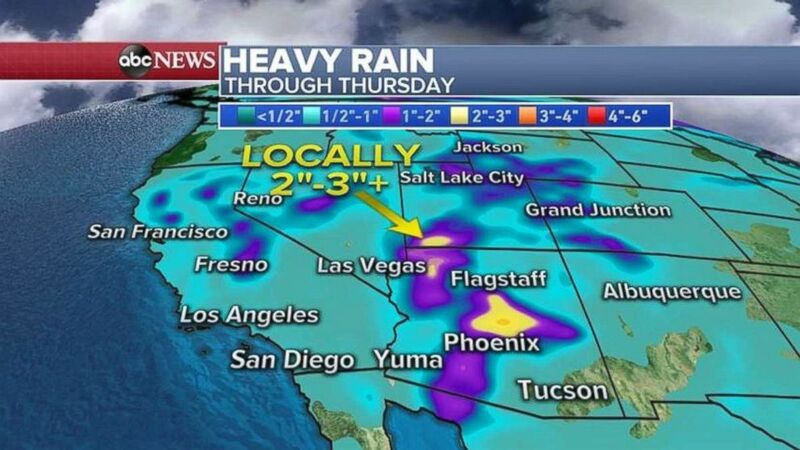 Some areas from Arizona into Utah could see more than 3 inches of rain on Tuesday, which will lead to flash flooding. In addition, a separate storm system is moving into California and will bring early season rain from San Francisco to Los Angeles. (ABC News) Rainfall totals will be 2 to 3 inches locally in Arizona and southwest Utah. There's also a chance for severe weather in the East on Tuesday. The same storm system brought up to a half a foot of rain in Iowa -- flooding streets and neighborhoods. The biggest threat for the Northeast will be damaging wins, large hail and even a threat for an isolated tornadoes. 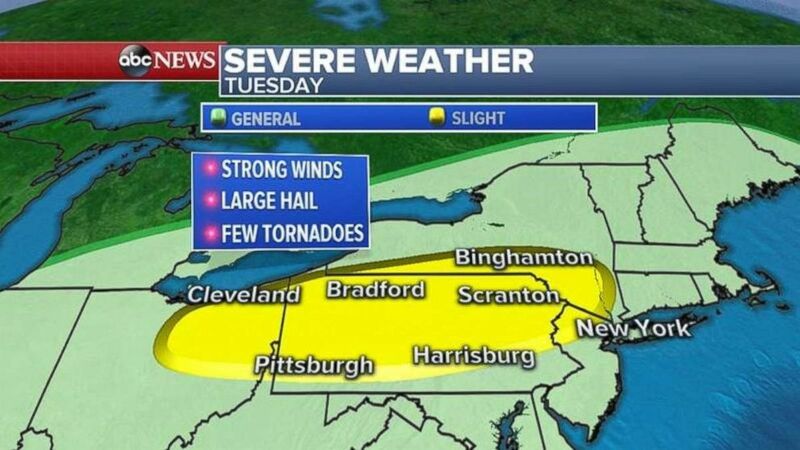 (ABC News) Severe weather is possible from northeast Ohio throughout Pennsylvania and the Lower Hudson Valley on Tuesday. Temperatures will be running 10 to 20 degrees above normal east of the Rockies through the middle of the week. 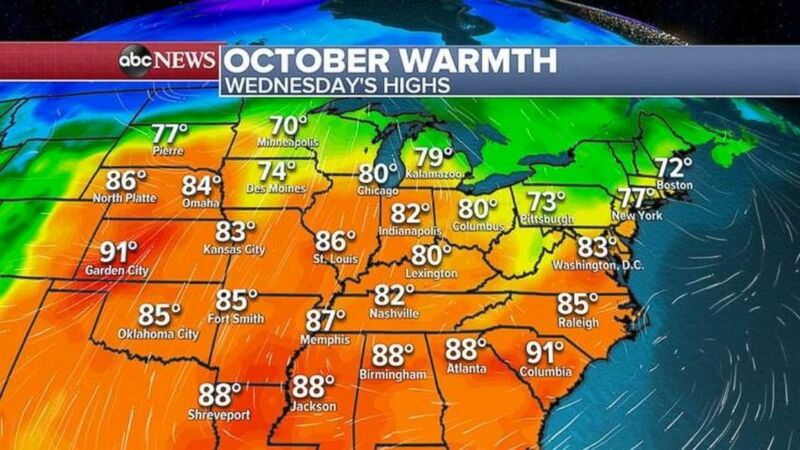 There will be 80 degrees readings in Kansas and Chicago on Wednesday. (ABC News) October temperatures will be more like summer than fall throughout much of the country east of the Rockies. Unseasonably warm weather will even stretch into the Northeast and New England. The warmest day this week will be Thursday in the Northeast with 80s in New York City and near 90 in Washington, D.C. And even usually chilly Boston will see temperatures near 80 on Thursday.